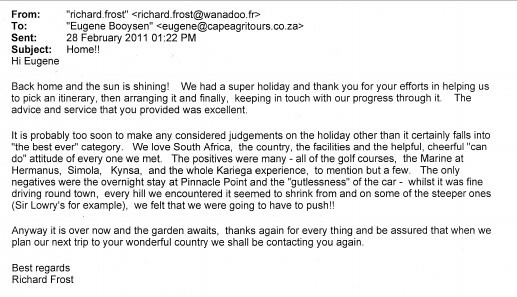 For more than 21 years now, Cape AgriTours has been in the fortunate position to play host to many select groups and individual travellers. 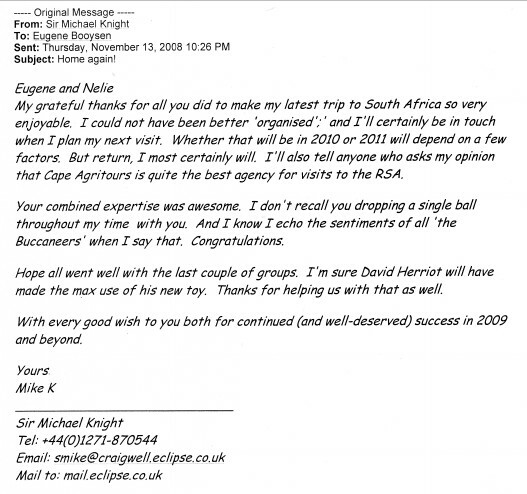 From business executives, conference delegates and families to honeymoon couples and sports fanatics – various people who have made the journey to South Africa. By all accounts, they have left our shores truly happy and only with the fondest memories, as the many thank you notes and letters undoubtedly confirm. Our past clients originated from all the continents of the world, including countries such as: Argentina, Austria, Australia, Belarus, Belgium, Benin, Burkina Faso, Chile, China (Hong Kong), Croatia, Czech Republic, Democratic Republic of Congo, Egypt, England, Eritrea, Estonia, Ethiopia, Finland, France, Germany, Ghana, Greece, Guatemala, India, Indonesia, Iran, Ireland, Israel, Italy, Jordan, Kenya, Latvia, Lithuania, the Netherlands, New Zealand, Niger, Nigeria, Malaysia, Mexico, Pakistan, Romania, Scotland, Serbia-Montenegro, Singapore, Slovakia, Slovenija, Spain, Sweden, Switzerland, Taiwan, Tanzania, Turkey, Ukraine, the United States of America, Uruguay, Wales and Zambia, while outbound tours have also been arranged for South African groups and individuals to Australia, Brazil, China, France and the USA. Egyptian Mango & Table Grape farmers study tours - 2 groups, March 2002. Austrian Young Farmers tour to SA Congress, February 2002. Apimondia (Beekeeping) post-congress tour from Austria, November 2001. 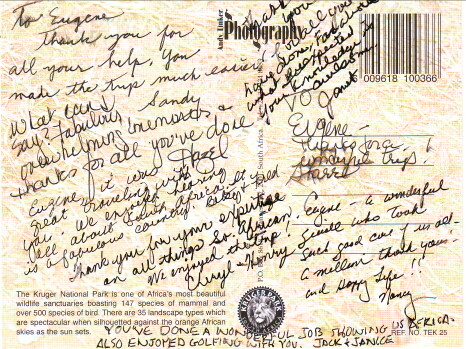 Cape Town & Garden Route for American Hunters Group, June/July 2001. Study Tour (follow-up on the 1999 tour) for a Government delegation from Eritrea, June/July 2001. Day trips for the A-Snapp Roundtable Meetings (natural products production) (April 2000). 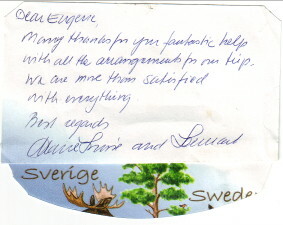 Swedish wine tasters, Stockholm, Sweden (March 2000). Turkish Fruit & Grape Group, Yavuz Taner, Istanbul, Turkey (February 2000). Australian Dairy delegation, AgTour Australia (January 2000). Uruguayian Wine Tour, Eduardo Abreo (January 2000). Indian Table Grape Study Tour, Bangalore, India (December 1999). Eritrean Government Delegation for a general agricultural study tour (including horticulture, agronomy and animal husbandry) (27 days) in November 1999. Burgundy/Cote D'Or Agricultural Management Group (general), Dijon, France (October 1999). Chilean Table Grape Producers group, with government support, Alexandra Nuñez Sorich, Copiapo, Chile (September 1999). Messrs Walter Monari & Andrea Bernardi, Consorzio della Ciliegia della Susina e della Frutta Tipica di Vignola, Modena, Italia (plum study tour). A table grape and fruit study tour to South Africa, Davidi Heyman, Israeli Fruit Board, Israel. 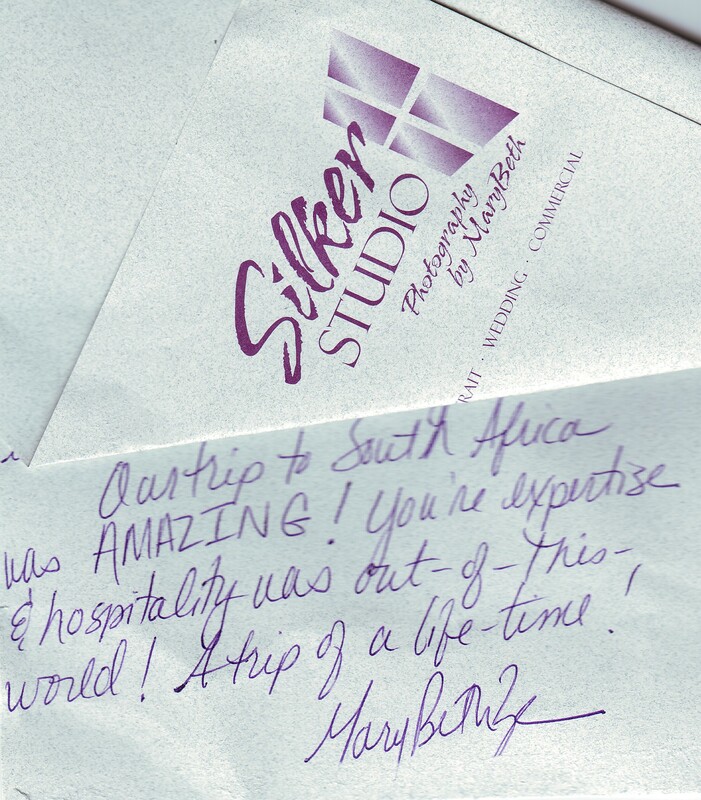 A wine study tour to South Africa, Davisville Travel, California, USA. Organisers of an ACTIM (France) technology transfer seminar (Somerset West, 1998). Organisers of the joint International Entomological Congress (Stellenbosch, 1997). Organisers of the General Assembly of the OIV (Cape Town, 1996). SASEV, Organisers of the International Table and Raisin Grape Symposium (Cape Town 1997). Uruguayan Fruit Producers and Buyers, Montevideo, Uruguay. Group: Fruit and wine producers. Weingut Milz Laurentiushof, Trittenheim/Mosel, Germany. Group: Wine farmers exhibition. Glaswerk Ernstthal, Wuppertal, Germany. Group: Wine farmers exhibition. Skalli.Fortant de France, Montpelier, France. Group: Winemakers (cellars and vineyards). Ljubljanski sejem, Ljubljana, Slovenija. Group: TV production team - promotion of tourism in the wine industry. APCA (general agricultural association), France. Group: Directors of APCA (different fields of agriculture, including both horticulture & animal husbandry). Chateau de Milly, Chablis, France. Group: Wine producers from Burgundy (cellars and importers of wine). EMTS, Organisation de Voyages Specialists, Tours, France. Group: Cama Sanders - feed producers (cattle, pigs & chicken).